I frequently draw other people when I’m in waiting rooms or in a cafe. Most of the time nobody acknowledges my presence, or if they do, we exchange slight nods or smiles. This time, I did not notice a woman who was watching me as I was drawing a fellow waiting room waiter. She attracted my attention and, with gestures, asked me to draw her! I tried very carefully to create a passable likeness. She seemed pleased when I showed her the results. 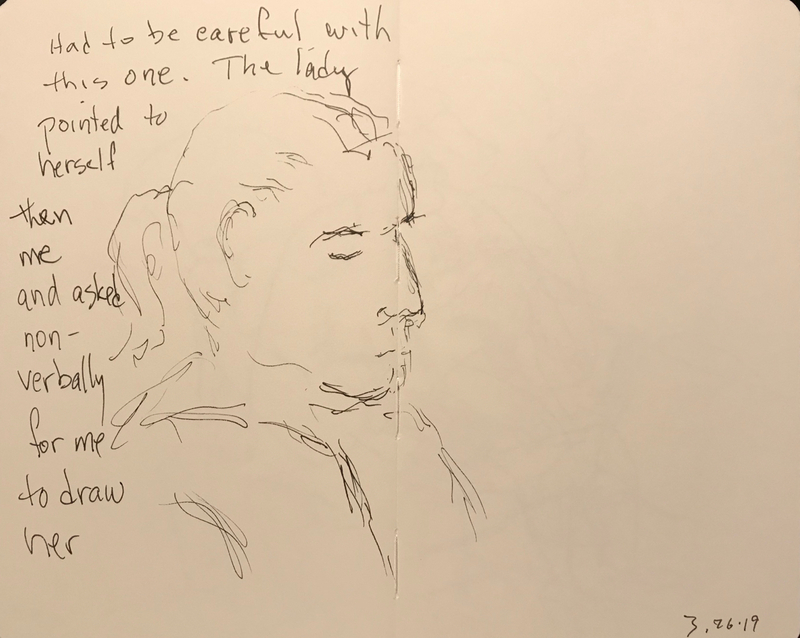 This entry was posted in Personal Stories and tagged artistic impression, careful rendering, commission, drawing, pen and ink, pen and ink sketch, portrait, sketch, visual art, Waiting Room. Bookmark the permalink.